How many emails get sent a day? >> How many emails get sent a day? It is an interesting statistic to know. 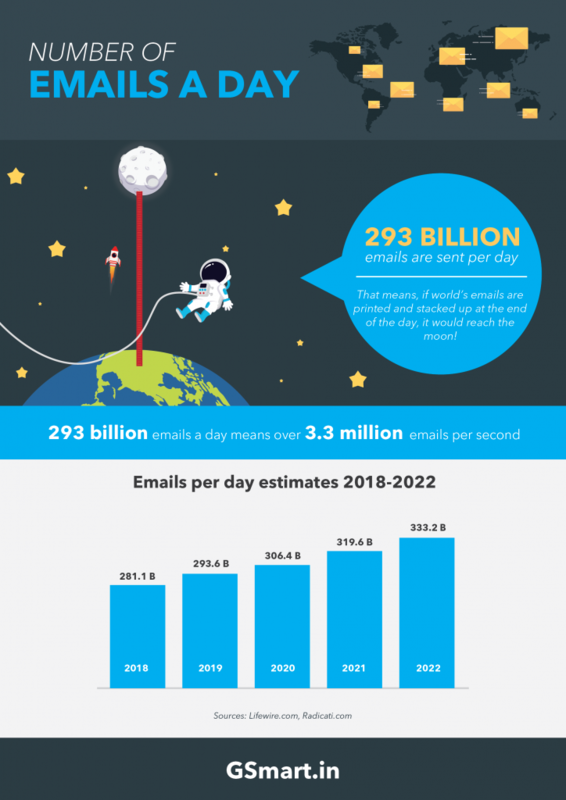 How many emails are sent per day in the whole world? It is estimated that 293 billion emails are sent every day. The number will grow to 333 billion by the end of 2022. According to some estimates, 53.5% of all the emails sent is spam. In other words, email usage is far more than that of social media channels combined. Why is Email so popular? Email contnues to be the most popular communication channel for business communications. How popular is email? THE RADICATI GROUP, INC (2019). Email Market, 2018-2022. [online] Radicati.com. Available at: https://www.radicati.com/wp/wp-content/uploads/2018/01/Email_Market,_2018-2022_Executive_Summary.pdf [Accessed 14 Feb. 2019]. Statista, https://www.statista.com/statistics/456500/daily-number-of-e-mails-worldwide/ [Accessed 14 Feb. 2019].